I've always wanted to mess with a tub of starch! (Where do you get your great ideas!?) I hope you can show us what the starched flower looks like. Also, what is that charming cluster of strawberries on the napkins? There's something very relaxing about repetitious folding. We used to make waterlily napkins like this. Lately I've been making Waldorf stars with the same soothing effect. Is the wedding imminent? I'm guessing they're getting married right after Christmas, like Felix did. 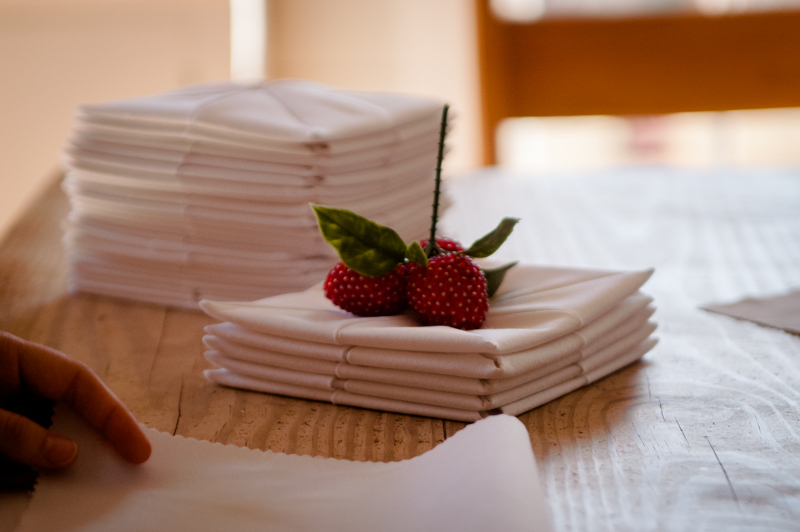 The napkins are a lovely idea. Is this another *Christmas* wedding? I love it! OOh! love! The wedding must be soon! Everything about that post makes me smile. How lovely. Wishing the lovely bride, handsome groom, family and friends a wonderful wedding morning. Many blessings!